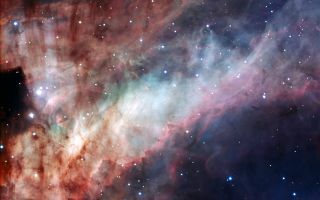 Three-colour composite image of the Omega Nebula (Messier 17, or NGC 6618), based on images obtained with the EMMI instrument on the ESO 3.58-metre New Technology Telescope at the La Silla Observatory. North is down and East is to the right in the image. It spans an angle equal to about one third the diameter of the Full Moon, corresponding to about 15 light-years at the distance of the Omega Nebula. The three filters used are B (blue), V ("visual", or green) and R (red). This cool space wallpaper shows a three-colour composite image of the Omega Nebula (Messier 17, or NGC 6618), based on images obtained with the EMMI instrument on the ESO 3.58-metre New Technology Telescope at the La Silla Observatory. North is down and East is to the right in the image. It spans an angle equal to about one third the diameter of the Full Moon, corresponding to about 15 light-years at the distance of the Omega Nebula. The three filters used are B (blue), V ("visual", or green) and R (red).